At the turn of the century, skiing was already one of the most popular recreations in the Great White North. As you can see, though, there was little fancy equipment involved. You needed a good strong herringbone to get back up the hill. No tow ropes or ski lifts then. Women had to contend with skirts even on the slopes and this skiier seems to be using her pole as a tripod support on the way down. Some decided the most prudent path was to navigate the hill without skis! Still, they all had a lot of fun. Tommy Burns is seen here in action in the Squires fight of 1907, where, in one short and furious round, he demolished Bill Squires to retain the world heavyweight boxing championship which he had won in a 1906 fight against Marvin Hart. With broad shoulders and quick hands Burns easily put off the rushing tactics of Squires. Few openings were missed by Burns as his crushing right hand rapidly rendered the American fighter from aggressive to wobbly to the long count. Squires, to his honour, didn't hide in a defensive posture, but continued his upright short march to defeat. The fight lasted three minutes and saw Burns knock his opponent to the canvas three times. At the end of the fight some fans try to rush the American flag into the ring even though a Canadian had laid to rest their finest. 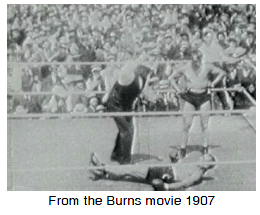 Burns gained the world heavyweight championship by beating Marvin Hart in 20 rounds in Los Angeles in 1906. In 1907 he won the world light heavyweight crown from American Jack O'Brian, only to lose it a year later to America's first black champion, Jack Johnson. This fight broke the colour bar in the United States which had kept black contenders out of the ring (and out of the money), but in order to cross this line, Burns and Johnson held their fight in Australia because it was still illegal in the United States for a black fighter to fight in the same ring as a white boxer. Tommy Burns died in Vancouver in 1970. 1902 - The Edison Electric Theatre opened in Vancouver. It was Canada's first permanent cinema. 1902 - The Société symphonique de Québec was founded. Now called the Orchestre symphonique, it is the oldest active orchestra in the country. 1908 - Lucy Maud Montgomery published Anne of Green Gables. This became a tremendously popular book. Several sequels were published and over the years films and musicals have been written based on the story of the spirited orphan who changes the lives of a small community on Prince Edward Island. 1909 - This was the first season of the National Hockey Association, forerunner of today's National Hockey League. 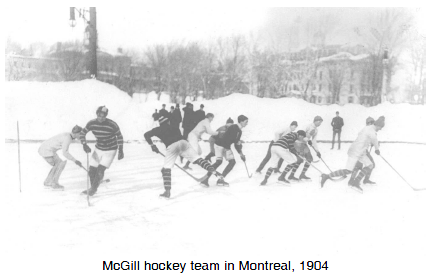 Hockey was now a professional sport. 1913 - Louis Hémon, who immigrated to Canada from France in 1911, published Maria Chapdelaine, a novel about pioneer life in rural Quebec.